Foundation Stone of the upcoming M.K Nambyar Lawyers Academy for Continuing Legal Education was laid by Chief Justice of India Justice T.S. Thakur today in the function organized by Bar Council of Kerala in Kerala High Court Auditorium. Justice Chalemeshwar and Justice Kurien Joseph of the Supreme Court, Chief Justice of High Court of Kerala Justice Ashok Bhushan, Leader of Opposition Sri V.S. Achuthanandan, Senior Advocate K.K Venugopal were also present for the function. Sri K.K Venugopal who welcomed the dignitaries spoke about the need of having a Lawyer’s Academy. He said that India has about 1.3 Million lawyers and not everyone has their father or uncles to guide them in the profession and it is for them such an Academy will function. Sri V.S. Achuthanandan conveyed his best wishes to the initiative and said that lawyers should introspect before demanding exorbitant fees from clients. Even I was asked for 60 Lakhs as fees by a Senior Lawyer for presenting my case concerning a public issue, Leader of Opposition said. Justice Kurien Joseph suggested that mass oath taking ceremony of Lawyers should be replaced with Individual oath taking, as it was there during olden times. He said an oath should be drafted for the new entrants to the legal profession which should be memorable. He also said Judges should not leave the Court before court hours, and should sit full time, and lawyers should cooperate for that. Chief Justice of India, speaking at the function said that he is an admirer of K.K Venugopal’s scholarship and he knows him for 40 years. Responding to V.S. Achuthanandan, Justice Thakur said that Lawyers demand fees not in lakhs, but in Crores these days. At the same time, he said that there are lawyers who do pro bono too. 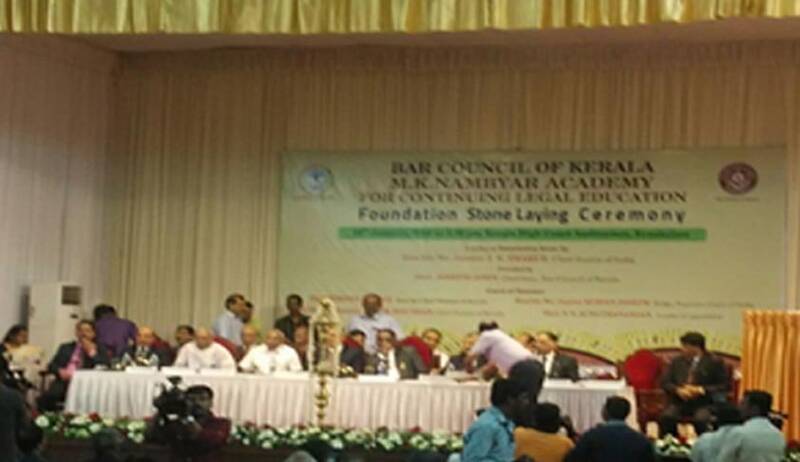 Bar Council of Kerala’s Academy for continued legal education is being set up in association with the M.K. Nambyar Memorial Trust headed by senior lawyer K.K. Venugopal. It will come up on a one-acre land at Kalamassery allotted by the government. The academy is being established on the lines of the Judicial Academy for judges.